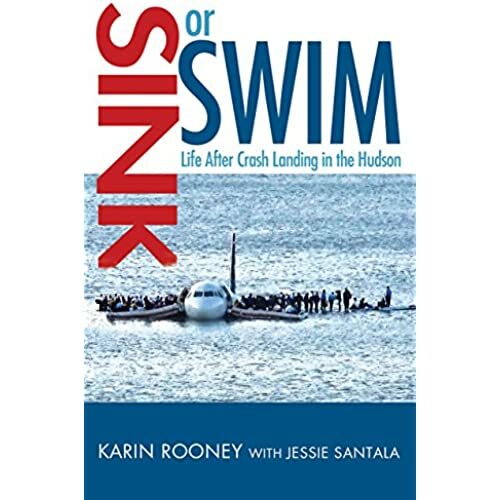 I just finished flying through – excuse the bad pun – Sink or Swim: Life After Crash Landing In the Hudson and I set on a mission to dig deeper with co-author Jessie Santala. For my thoughts on the book itself, check out my review on Goodreads. Q. How did you first meet Karin Rooney and how did you become involved co-authoring the book? A. Like all great Hallmark movies, we met at a wedding. 😉 It was 2010, a little over a year after the crash and I was photographing a wedding she attended. We started talking during the reception and she asked me what else I did for work. It struck me as an odd questions since everyone assumed I did photography full-time. I had just graduated with my master’s degree in Creative Writing and so, in an act of rare confidence, I said that I was also a writer. She immediately brightened up and told me she wanted to write a book about her experience with Flight 1549. She asked me if I wanted to help her and, not knowing exactly what I was getting in to, I said yes. It is unlike me to just jump into something like that, but Karin’s enthusiasm is contagious and I felt that we had an immediate connection. I believe with all my heart that it was a God-ordained meeting and conversation. We exchanged contact information and agreed to meet up to chat soon after. It was really that easy. Q. What was your duty in the writing process? A. Karin has said from the start that she isn’t a writer, but that she has a story she wanted to tell. She needed help getting her story down on paper. We spent many hours together, just chatting, so that I could get a sense for her voice and speech patterns. I formally interviewed her about the crash 3-4 times and recorded those interviews so I could make sure to get the details correct. Once I transcribed the interviews, I would email her follow-up questions about details or other facts that I felt were missing. Writing about her emotional journey was a little more challenging. As her healing unfolded, she would call me or email me about her most recent “break-through” and I would immediately write out what she was saying, just in case we wanted to include it in the book later. Most of those moments were included, but it took time to see how they all were connected and ultimately, where her healing was going. I feel like my main job was to simply record her story and then organize it in a way that makes it easy for other people to read and digest. Q. How long was the writing process from conception to reality? A. The whole process took about six years, from start to finish. A lot of that is due to the journey of healing she was on. We didn’t want to tell an incomplete story and while she is still working on healing, she finally got to a healthy place where she felt ready to share her story with the world. Part of the reason that it took so many years is also due to the fact that, between the two of us, we have had five babies, moved several times and changed jobs a couple of times over the past several years. Finding a publisher also took us a while and, after signing our contracts with Deep River Books, it took about a year to get the book into print. Q. What about Karin’s story do you relate to? A. I relate to the parts that I think everyone can relate to: Struggling with fear and anxiety, the desire for control and the aversion to feeling out of control (which I struggle with daily), the search for healing after emotional turmoil. Karin herself admits that being the survivor of a plane crash is nearly impossible to relate to, but the emotional effects of the trauma she suffered are (unfortunately) something that we all recognize. Q. What is the biggest message you hope readers take away from the story? A. I want people to know that, if they are struggling, they are not alone and that it’s ok to not be ok. I don’t think we know how to simply BE with people in the midst of their pain. We fixate on fixing problems and often times start reciting Bible verses or cliché sayings because we don’t know what else to do. We often, myself included, do more damage to the grieving because we want to make everything “better” because we are uncomfortable with grief and pain. I hope that this book gives people the freedom to grieve at their own pace and also helps start a conversation about how to better comfort those who are grieving around us. I also hope people finish the book with a better understanding that God cares for them. Q. Do you plan to write with the intent to publish again? A. I would love to be able to publish another book. I am submitting essays these days since book manuscripts are so time consuming, but I do hope to write another book eventually. Q. In an ideal world, what would you love to write and see published next? A. In an ideal world, I would get to write a non-fiction book full of humorous and honest parenting stories. We have a unique situation with our babies being six months apart and it has created some (now) humorous adventures in our home. I would also love to write a fiction book about Japanese-American internment since that has had such a huge impact on my family. It’s not a light topic by any means, but I think it is an important one and one that doesn’t get enough attention. Jessie M. Santala has her master’s degree in Liberal Studies with an emphasis in Creative Writing from the University of Denver and has had several stories published in the highly popular Chicken Soup for the Soul series. She has loved reading and the written word since childhood, although she has only recently worked up the courage to call herself a writer. Some of her favorite authors are Brene Brown, Elizabeth Gilbert, L.M. Montgomery, Louisa May Alcott and Jen Lancaster. And so many more!